Earlier this year I started a bespoke summer suit with tailors Manning & Manning. 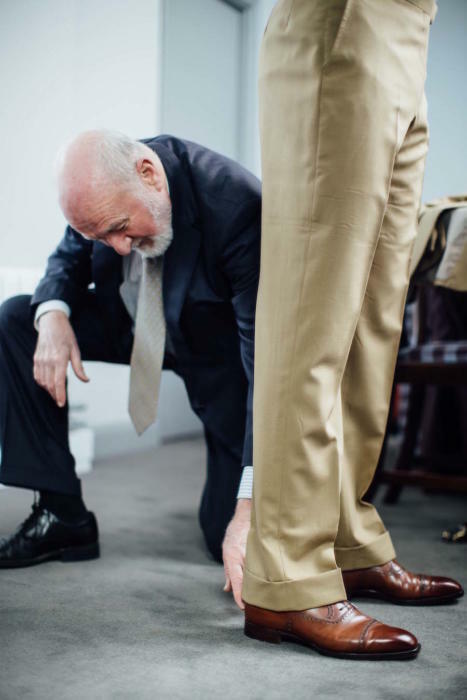 They are a small operation comprising old Row cutter Bryan Manning (above) and his son, with the making outsourced to various coatmakers and trouser makers. Rather like other tailors covered recently, such as Whitcomb & Shaftesbury, I was interested whether Manning & Manning could provide an entry-level bespoke experience, given their low costs but experienced cutting. Bryan has an interesting background, having worked for many film and TV operations making period suits. He won an Emmy in 1985 for his work on the suits for ‘Wallenberg: A Hero’s Story’ starring Richard Chamberlain. Bryan came from a family of tailors, apprenticed at Kilgour French & Stanbury and became a trainee cutter there a few years later, in 1959. In 1970 he opened his first shop on his own, and had outfits on St Christopher’s Place, Savile Row and Maddox Street. In the early 1990s Bryan shifted to being a travelling tailor, and was joined by his son in 1997. He sees clients in the Holland & Sherry showrooms on Savile Row. In yet another twist on the standard Row model, Bryan offers two services: Semi-Bespoke and Full Bespoke. Both are cut by Bryan to a fully bespoke paper pattern, but the former has a fused chest piece and the latter a floating, hand-padded one. Semi-Bespoke with a fused interlining costs £1000. It’s hard to recommend that, given that you can get a Graham Browne floating interlining for the same price. But the Full Bespoke costs only £1350 (both inclusive of VAT). It’s a high-twist fabric, so like Fresco it can have a slightly open weave and wears cool in the heat. It is also pretty crease-resistant, making it good for travelling. Hard creases will need to be pressed out, but that’s the same with most high-twists. It isn’t as coarse as Fresco, which makes it nicer against the skin, although not as hard wearing (not much of a concern for me as it’s unlikely to be an everyday suit). I liked the colour as it is a muted tan, with a touch of olive. Not too classic and colonial, but definitely a summer suit. The photographs here are of the second fitting. 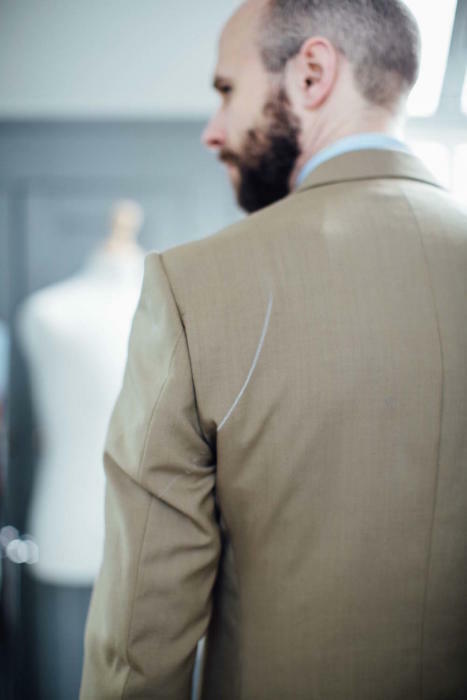 Bryan likes ready-made fitting jackets alongside measurements, which some people sniff at but several high-end tailors (including Camps de Luca) also use. He makes use of that system to go straight to a forward fitting, with no baste. This works well if fundamental things like balance are correct straight from the off, but involve more work if they are not. In my case, the front-to-back balance did need some alteration. The second fitting was good. Just a few minor things to clear up here and it should be ready. Bryan’s style is solidly English military, with a built-up shoulder, structured chest and longer jacket. (By comparison to the French and Italian tailors, rather than others around the Row). You can follow the discussion on Manning & Manning bespoke tailoring by entering your email address in the box below. You will then receive an email every time a new comment is added. These will also contain a link to a page where you can stop the alerts, and remove all of your related data from the site. I’m a big fan of this H&S bunch, and like the colour choice for a summer suit, but to me it looks as though the coat is too short. Was that adjusted at the fitting? This is definitely a lovely suit for the Summer! I have read so depressing comments that I would suggest to their authors to restart reading PS from the beginning! Sorry for being so blunt! Indeed, I do not agree at all with those – and even perhaps with you – as to the length of the jacket. I think, its length is really fine! Yet the flaps of the pockets may need to be shorten a tad. As you know, it’s easy to mistaken the visual effect of the flaps for the length of the jacket itself! For sure, a balance would also be required while doing so. But the thing really worth considering is surely the length of the trousers as well as how wide it should be. There too, I trust your your keen eye while ensuring to strike the right balance! 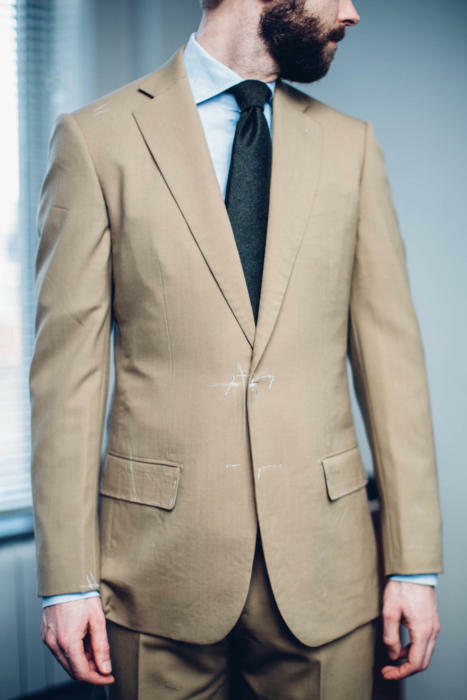 Once these alterations have been expertly done, you can definitly start figuring out what kind of accessories and shoes would make the best out of this suit: any hues of brown and green ties – I pesonally would go for the darker ones (see: Italian background) – , and as to shoes, in addtion to these Bemer’s, the EG’s Asquith and the like, I would highly recommend your AS’s HG suede monk strap with … lovely green socks! I hope you will post the final shape of this suit! A great idea for having tried out Manning & Manning’s tailoring for us! Thank you so much! Cheers John. Always love it when people reference the Italian Background! The proportions do look off; the pockets appear a little low. Otherwise it looks lovely. Have to say, not the nicest suit you’ve written about. The trousers look way too wide at the hem and the jacket sleeve looks dodgy. The trousers are certainly not flattering. Simon, would you recommend his style to someone ‘large’ like me? I don’t mean fat, I mean people like me that have a rather muscular complexity, with a large chest and even larger shoulders. I am not tall but probably above the height of the median person – I am between 1,80m and 1,85m – and I guess that a more ‘military’ style could work well with my body. Yes, i think so. It’s a question of what you want to emphasise or de-emphasise. This could be quite slimming in the waist but would give a strong chest and shoulders if anything. Yes, I know that bespoke is slimming. 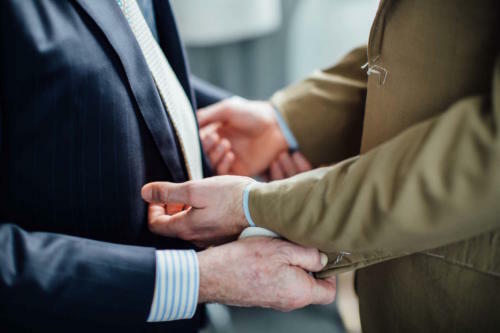 I have few bespoke shirts and all of them – regardless of how much I’ve paid for them – make me look almost ‘slim’. When I compare them to RTW shirts – even high end ones – the difference is striking. I’d like to de-emphasise my chest, I think it’s slightly too big. I do a lot of exercise a lot – boxing mostly – and even when I am in almost perfect shape I always have a thorax somehow larger than the rest of my body. I am not sure what kind of house style could ‘conceal’ it. Most things apart from a drape cut (Anderson & Sheppard, Steven Hitchcock) should do that. Attitude to shoulders varies far more. Mention it to your tailor when you go to see him. Hey Simon, how would you compare the value vs. W&S? In terms of make / finishing, is this on par with ‘mainstream’ Savile Row tailors as would be the great value bespoke from W&S? I know this is still only a fitting but reading between the lines, it looks like adding £300 (incl. VAT) with W&S is probably better value? It’s only a fitting, as you say, but my instinct is that W&S might still be better value, yes. Hi Simon. Would you say this is worth the extra £300 or so to a GB suit? As somebody with broad shoulders and a large chest, I would dispute that the A&S drape cut is not slimming. 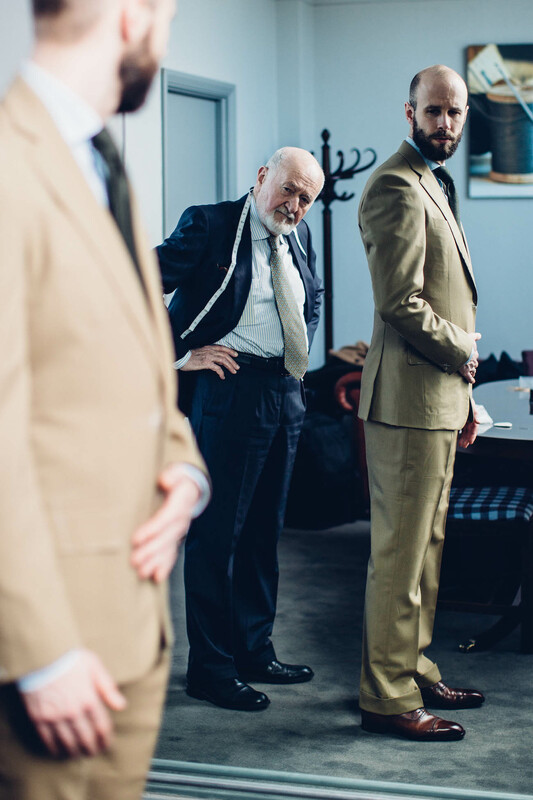 Personally I’ve found that it is the more structured tailors that emphasise a muscular physique while A&S tend to soften it – particularly with their single breasted house style. In fact I would say that wether or not A&S is for an individual is more about what sort of look you are after. Their style is more relaxed. Sorry if this sounds obtuse, but why would you wish to de-emphasise perfect shape? Most men want to maximise their chest:waist ratio. I would never claim to have the perfect shape albeit, for a man of my age I have put effort into not going to seed. But, I don’t want to look like a bouncer and the typical Row military cut does that. For me A&S is perfect and I’m always reluctant to go elsewhere. I’m surprised the jacket came out that short. The cloth looks fetching. Lovely video, thanks for sharing that. I think Bryan’s commentary was spot on. 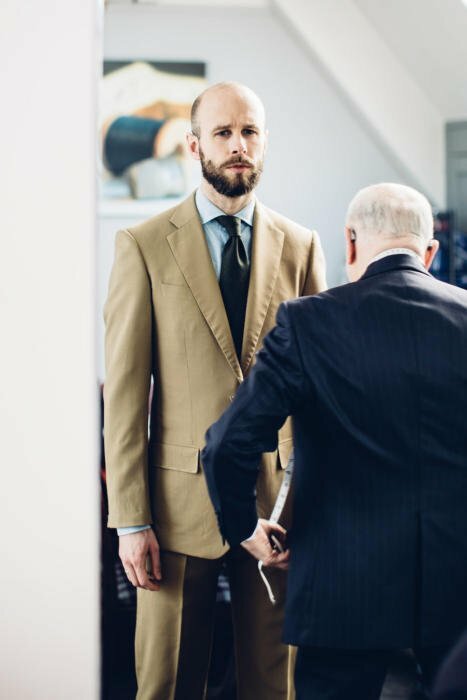 Hi Simon, can you please tell us the level of hand making/finishing in this suit? Style, fabric and cut are personal preferences which can be debated forever, but I am more interested in the crafting of the garment – does £1,350 include much hand stitching or finishing work? The pockets do look too low and, overall, it looks a little out of synch (jacket length, trouser length and width etc.) with some of the finer cuts you have had lately (W&S etc.) however in fairness to M&M the suit should also be shown when finished. Nice video thanks for sharing and amazing summer suit with a great color selection. Hi Simon, those Stefano Bemer shoes of yours really are fantastic. Do you do something special with the polishing (darker on the toe caps?) to get them like that? Would that be just a smudge on the end or would you cover the whole toe cap in darker polish? I always polish with just a little – you want to build up small layers. But do one or two matching colours in between each dark one. Always err on the side of subtle. I’ve loved the Stefano Bemers since you first featured them…possibly the best of all the fine shoes that you have? Hi Simon, I hope that this question is suited to this particular post… I am about to order a pair of straight (narrowish, but not in any way tight) dark grey flannels from my tailor. Although he has made some wonderful trousers for me I have never ordered a pair with turn ups. I know you favour a 2″ but I have short legs and am worried that 2″ turn ups (or turn ups of any size for that matter) may just make my legs look even shorter. Can you please give me any advice or should I just stick with the plain bottoms I am already happy with? Hi. 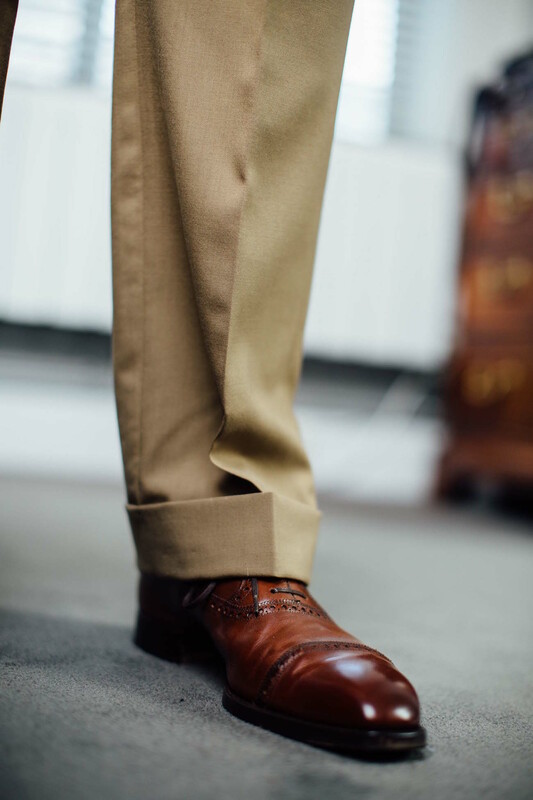 Turn-ups will certainly make your legs look a little shorter, but it really depends on how concerned you are with that. Looking a tiny bit taller is not the most important thing in the world. Thanks Simon, much appreciated and have a great weekend. I have a question, more out of interest than anything. How does the outsourcing of the production work? How does he make sure your measurements and your unique details are transferred to the producer in a way that they know how to make the fit work? Seems like a very hard thing to convey. It’s how the vast majority of Savile row tailors work – as all coatmakers and trouser makers are freelance and often work for lots of people. So people are used to it. It was significance to me, thanks author for taking out some of your precious time and sharing your thoughts on bespoke tailoring subject. It has some valuable content on this topic. Thank you for compiling it into an easy to read and well written post. Hi, may I ask what is the exact thing that you don’t like about looking “colonial”? Is it outdated or just because it’s not a good reminder of history? leaned a lot, but it seemes that there is spelling mistake… like measurements instead of measurememts?